This week we showcase some of the very cool things you can do with the very cool new product from Strano Designs called Ribbonstiff. Applying this product to ribbon allows you to use your ribbon as you would paper, enabling it to be cut into shapes, punched, embossed - how you use it is limited really only by your own imagination. This was Chris's first experience with ribbon stiff and she was amazed at how the ribbon stiff allowed her to manipulate the strano ribbon. She created the flower embellishments Chris applied the ribbon stiff to the 'Erin' and 'Molly' strano and once dry she used two different sized punches to punch out some circles. For the larger circle she then cut wedges from it to create a flower appearance. She layered the small circle on top of the flower and secured with a brad. The scalloped edges on Chris's layout were also created using the ribbon stiff applied to the Erin and Molly strano ribbon and for extra effect Chris also used a tiny hole punch on the scalloping. Chris used the Scenic Route North Shore papers and Queen & Co. 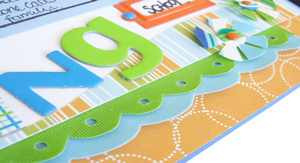 Cloud 9 Fontastics & sequins to complete the fresh look to this layout about her daughter starting school. Check back next Tuesday to see the myriad of different ways our design team has applied RibbonStiff in their projects.